The Neptune Systems Apex-EL Aquarium Controller has built-in WiFi, Temperature, pH, monitoring and much more!. 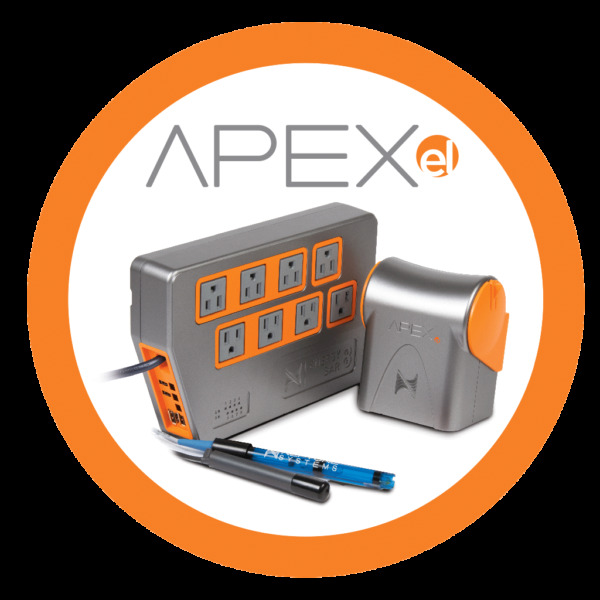 Set reminders, log testing and dosing information, and access your tank from anywhere with Apex Fusion! Get all the features of the flagship Apex Controller System at an affordable price with the Apex-EL Aquarium Controller System. Included WiFi lets you now connect to the internet even easier. With the Fusion Cloud interface, everything is easier from calibrating probes to customizing outlets. Fusion gives you the ability to monitor and control you Apex from anywhere in the world. The Neptune Systems EnergyBar 832 has been completely redesigned, with more robust outlets, individual LEDs show the status of each outlet, per outlet power consumption monitoring, and 1Link Accessories like the DOS and WAV pump can now connect directly to the EnergyBar 832 saving room and eliminate messy cords keeping your tank's equipment looking perfect.